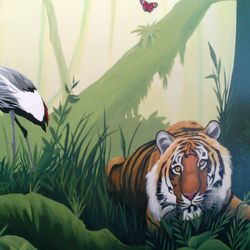 This was a large jungle mural painted in a primary school in a little village called Vigo which is near Dartford in Kent. 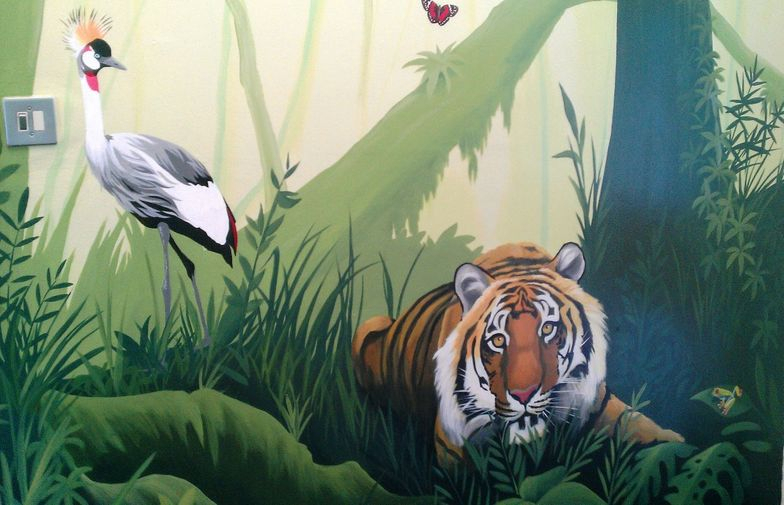 It is painted in their school hall and took two weeks to complete. 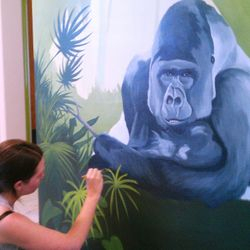 I had to use a scaffold tower for this mural as a majority of it was up high. 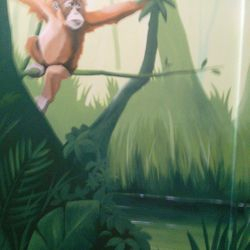 I also had to contend with painting around the stage lighting rigs and the climbing gym. 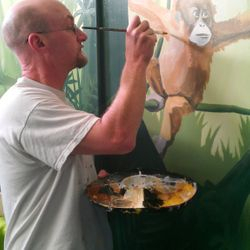 This next jungle rainforest mural is in a corridor of an infants school. 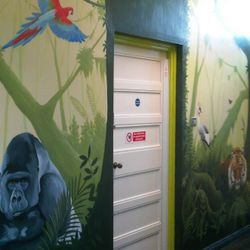 This jungle rainforest was painted in a corridor in an infants school in Leicester. 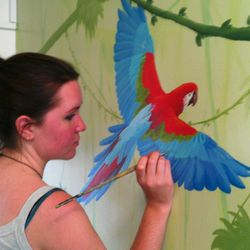 It's all hand painted on both walls and goes up to 12ft high! 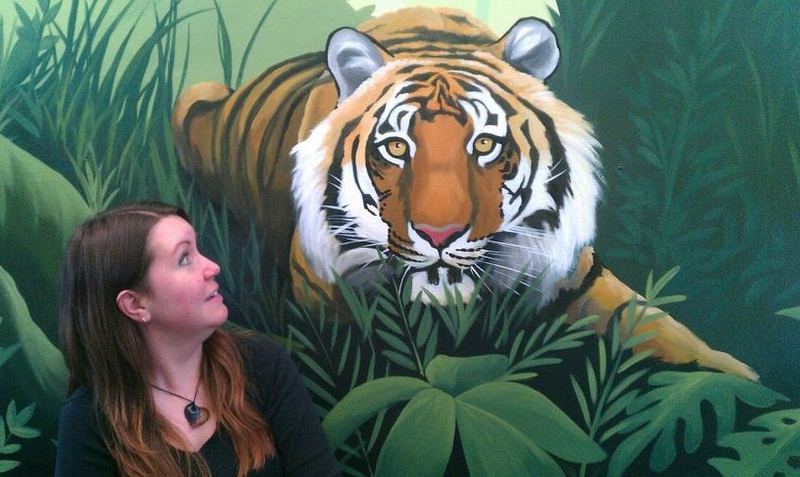 This detail of the left hand wall features a life-size tiger! 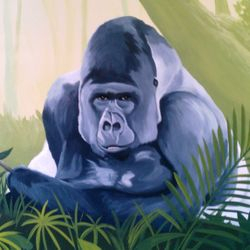 To the left of this wall is a friendly looking silverback gorilla. 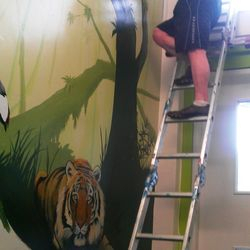 We painted a large tree in the middle to accomodate the door in this middle of this wall. 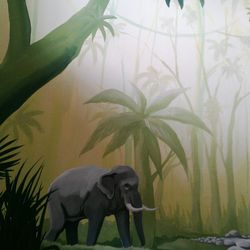 The other wall starts with an elephant going to a stream for a drink, whilst a monkey looks on. 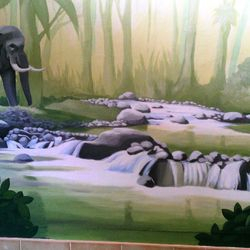 The stream leads into a waterfall giving the mural a sense of depth and opening up the corridor. 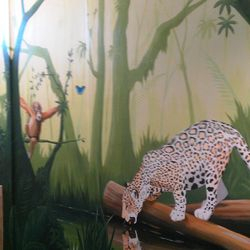 The waterfall goes right along the wall, leading to a leopard who is reflected in the water. Not all of the animals are large! He's looking at the butterfly! 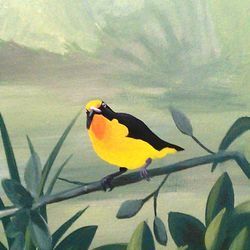 .. but that gives us plenty of room for birdlife! 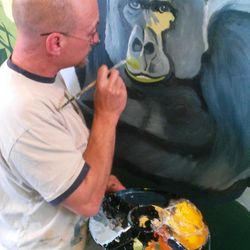 The great ape is taking shape!